There’s nothing quite like relaxing in a hot bath after a hard day’s work or running a marathon, whatever floats your boat. But it’s not as much fun if your bathroom is a bit drab and tired looking. 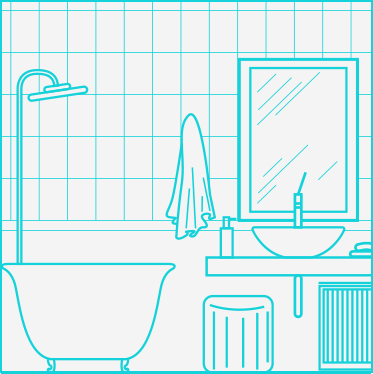 A bathroom needs to look good but must also be a practical user-friendly space; that’s why your bathroom design is so important. Why not transform your bathroom with a renovation that will make a huge difference to your home life without breaking the bank? Contact our friendly team at Kitchen Decor & Hi-Lite Bathrooms to find out how. Every homeowner wants to have a bathroom designed with an inviting and comfortable atmosphere for both your family and guests. As bathrooms come in all shapes and sizes, it’s important that you get the most use out of whatever space you have. View some of our completed bathrooms for some inspiration. At Kitchen Decor & Hi-Lite Bathrooms we will help you choose from the different materials and products that we can use for a complete bathroom renovation. Our design consultants will consider the different limitations you face, including space, budget and your family’s needs. From our extensive experience, we understand that moving a key fixture like the toilet or shower is an option for someone with a large home improvement budget, whereas keeping them close together or in the same spot as before is a better option for others. Either way, we are never short of great bathroom ideas to suit all styles and budgets. Read some testimonials from some of our clients who now bathe in beautiful, newly renovated bathrooms. goes beyond providing a high-quality bathroom renovation at a competitive price. We also pride ourselves on the service that we deliver to all our clients. No matter how big or small your renovation, our team will work closely alongside you from start to finish, inspecting and evaluating every last detail until you’re completely satisfied. Whether you require a bathroom vanity or a brand new luxury modern bathroom, you’ve come to the right place. Fill in our online quote form and we’ll get back to you to discuss your renovation plans. Alternatively, contact us direct or visit our showroom in Welshpool.